When it comes to data, the most appropriate chart type depends on the message you’re trying to convey. Certain types of data visualizations more clearly express the relationship between elements, whereas others may confuse the viewer. 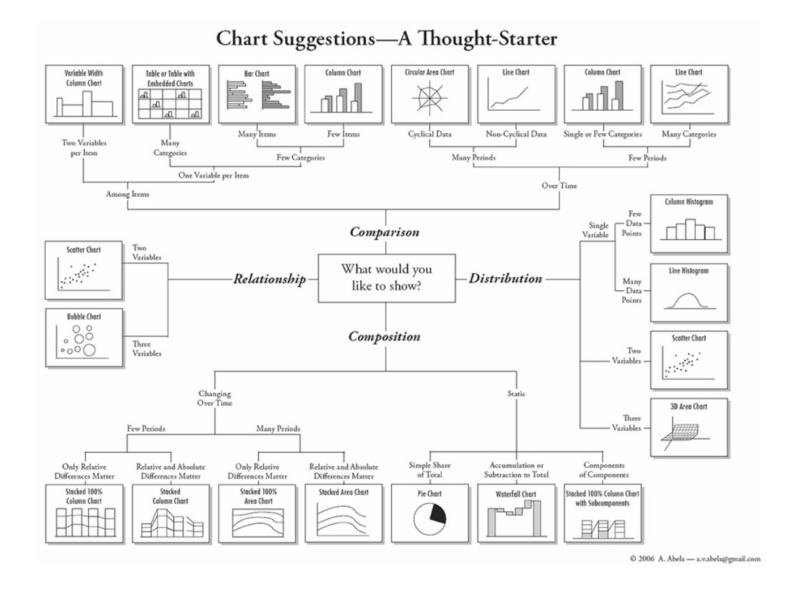 Use this guide to determine which chart type is best-suited for your data set. A relationship tries to show a connection or correlation between two or more variables through the data presented, like the market cap of a given stock over time versus overall market trend. A comparison tries to set one set of variables apart from another, and display how those two variables interact, like the number of visitors to five competing web sites in a single month. A composition tries to collect different types of information that make up a whole and display them together, like the search terms that those visitors used to land on your site, or how many of them came from links, search engines, or direct traffic. A distribution tries to lay out a collection of related or unrelated information simple to see how it correlates, if at all, and to understand if there’s any interaction between the variables, like the number of bugs reported during each month of a beta. Line charts are best used to express changes in a metric across time, or progress across a series of stages. This example uses a series to display four different metrics at the same time – each as a different colored line. Like line charts, area charts can also be used for expressing changes in a metric across time. Unlike line charts, area charts shade the area beneath the lines that represent metric values so that you can more readily compare data magnitudes. Scatter charts are useful for analyzing trends between two metrics — one along each axis — or for simply tracking the magnitude of two metrics from the same chart. Bubble charts are similar to scatter plots but offer an added functionality – the size of the plotted points can be set to change in proportion to the magnitude of a third metric. Bar charts allow you to visually compare discrete categories of data. Horizontal charts focus more on categories which are compared, and vertical (also called column charts) are more about the data. Stacked Bar charts are similar to bar charts but offer a glimpse into the composite categories that make up each bar. Pie charts allow viewers to visualize component parts of a whole. If your aim is to accurately compare the component parts of your chart, be careful! The relative size of pie and donut slices can be hard to discern, so a bar chart might be your best option. If the goal is to compare a given category (a slice of the pie) with the total (the whole pie) in a single chart and the multiple is close to 25 or 50 percent, then a pie chart can often be more effective than a bar graph. This tutorial was originally written by Jeremy Rue for the Digital Media Skills Certificate course, and later modified for public use. This content may not be republished in print or digital form without express written permission from Berkeley Advanced Media Institute. Please see our content redistribution policy.